As usual you have 100 words to add to these to create a piece of writing. You can use any genre. Please make sure it is suitable for a PG certificate. A homespun fire to make the loveliest memory. This is really beautifully written. Lovely imagery. This is really nice, and I loved the photo. Well done. What a lovely moment they shared together. You captured one of those "perfect moments" we sometimes get to experience. 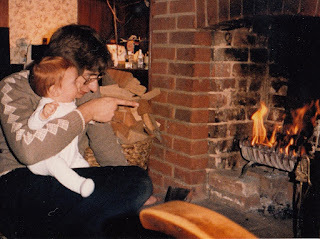 Sweet, treasured memories - glowing fire and flickering flames and the security of daddy's arms. That was so very sweet! I think all children should have the pleasure of having their pictures taken on Daddy's knee :) love it! and great job! I love this---the photo is simply gorgeous as well. The simple pleasures of life that we take for granted. Love your blog---I'll be back! Well constructed with beautiful images. Enjoyed this. Very beautiful poem, and a lovely picture to go with it. Beautifully written and the picture is just precious. Hmmmmm as a father of two boys I'm melting inside.....as a Bloke, I'd like to keep a stiff upper lip and say 'Good effort!'. Delightful, a real treasure! and nice to read something gentle after all the scary entries! What a lovely piece! I love fireplaces. oh my goodness..that is one of the most pro life poems I have ever read...I love it!! !